Regional riders can now pay for fares using a mobile wallet, such as AndroidPay, ApplePay, or SamsungPay, as well as any contactless bank card. 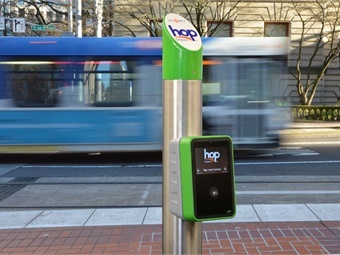 In partnership with TriMet, C-TRAN, and Portland Streetcar, INIT delivered the final element of the newly launched Hop Fastpass™ e-fare system — open fare payments. Regional riders can now pay for fares using a mobile wallet, such as AndroidPay, ApplePay, or SamsungPay, as well as any contactless bank card. They simply tap their phone on any of the 1,200 INIT validators and hop on board the Portland Streetcar; C-TRAN buses including The Vine; TriMet’s buses; MAX light rail; and WES Commuter Rail. Having the ability to pay with a credit card or mobile wallet frees riders from the worry associated with how many — or what kind of — tickets they should buy. They simply tap, hop on, and ride. In addition, Hop Fastpass™ cards offer daily and monthly fare capping so riders never have to worry about spending more than needed to take public transit. The plan offers riders greater social equity, and provides more cost-effective transport options for travel throughout the Portland-Vancouver Metropolitan Area. INIT’s back-end processing software, MOBILEvario, serves as the core intelligence for the account-based and open payment fare system. It manages and processes fares in real-time and recognizes and processes revenue sharing, as well as manages accounts and automates reconciliations for all three agencies. Off-line processing is another added benefit of the INIT system. 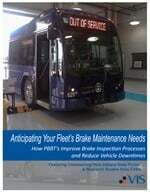 In the event of a network outage, fare payments can still be processed ensuring revenues are not lost. INIT developed the system using open architecture API’s so that other partners could be easily incorporated. As an example, the IVR system and mobile apps were able to easily integrate with the INIT open payments e-fare system which benefited riders using the system with further tools and greater functionality. TriMet and C-TRAN have the added benefit of a fully-integrated operations control and real-time passenger information system from INIT. The addition of the open payment e-fare component allows the agencies to realize a fully integrated Intelligent Transportation System. Due to INIT’s flexible and modular solution design, the e-fare module was installed within all Portland Streetcars without the need to interface with an operations control system. The open payments system within the Portland-Vancouver Metropolitan Region was implemented within budget and on time.